Xpu-Ha, Quintana Roo – On a beautiful 1-hectare jungle lot, sits a fully-furnished Eco-Home for sale in the Riviera Maya, Mexico – with self-sustained power! Only 1.5km to Xpu Ha beach, the most beautiful in the entire Riviera Maya area and one of the most pristine beaches in Mexico. There is a main house and a guest house, separated by a very large inviting resort-type swimming pool, and outdoor “palapa”-covered living area, where only the sounds of birds and animals around can be heard, providing total peace and tranquility amongst nature. The Main House is 3,500 Sq. Ft. And features an open floor plan, large kitchen with onyx counters, artisan marble sink, and a semi-formal dining area. The large living room adjoins to make a very connected living space. There are two huge bedrooms and walk-in closets, large open showers, and lots of natural light streaming in. Upstairs, on the flowing staircase, is a large office and TV room loft. High ceilings add more space to the airy rooms. Outside, you pass by the outdoor living area and walk to the pool, which is 2500 sq ft. and circular in shape. Across the way, you will find a comfortable, spacious guest house that is 1000 Sq. Ft. with an inviting veranda. 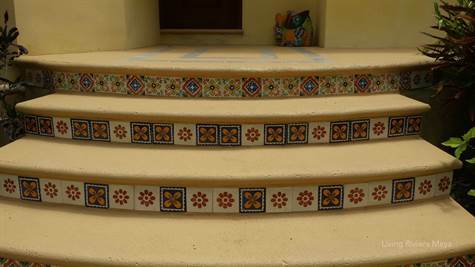 Polished cement floors throughout make the floor smooth and cool to walk. This, and a lot more, is “Casa jungla” – Your jungle hideaway in the heart of the lush Mayan Riviera. Los Arboles, Tulum – Casa Happy Destiny is a fully titled modern Mexican style home for sale, designed and constructed by Enrique Alcaraz, renown local artist and architect, in 2013. This home is situated on a five acre lot with approximately 1,000 square meters (approx. 10,000 sq ft) of cleared jungle for the home. 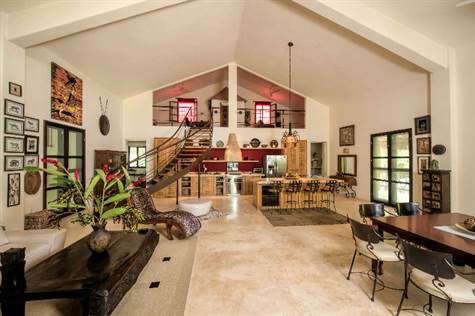 This Tulum home for sale sits in a secure gated community, Los Arboles, just outside Tulum. Los Arboles is unique in the world as each lot is 5 acres or more, When build, these luxury homes we planned to have very low impact to the environment, being built on a small percentage of the land. They are fully off-grid using the latest solar panel and wind generated power for the house. This home is truly an eco friendly home for sale in Tulum and unique in the world for its community . Individually designed and built, these homes are integrated with nature, surrounded with the serene solitude of the high jungle, no pavement on the roads leaving zero contaminants. Endemic flora and fauna abound, the jungle teeming with spider monkeys and lush green foliage ! Casa Happy Destiny home is only eight miles (12 kms) from world class Tulum beaches. Tulum is two hours south of the Cancun International airport. This unique piece of Riviera Maya real estate has 3 bedrooms. A large outdoor deck on the second floor, a small deck on first floor and upstairs bedroom with a large star gazing terrace on the top floor. Two full bathrooms and a half bath, washer/dryer closet, ample storage in two bodegas and numerous closet space. Solar powered home with generator back up, large water cistern ( water collection tanks) with two large tanks on roof to add pressure to the water, plumbed to the community water system. The house has an efficient reverse osmosis water purification system that is hooked into the refrigerator’s ice maker, which allows for pure drinking water without hauling water bottles. A large propane tank (300 litres) provides for cooking and water heating, requiring only infrequent refueling. A large mast provides for internet reception and cell phone service. Modern efficient kitchen with appliances and ample storage. Granite counter tops with a large bar for additional seating and serving. Beautifully landscaped with parking. Numerous ceiling fans throughout and house has plumbing and electrical for air-conditioning installation. Call us today to find out more. This beautiful sustainable home could be your today ! Owner financing can be considered.